The 31.5 metre explorer yacht Black Pearl, listed for sale by Lars Bjorklund at Ocean Independence, has had a $1,000,000 price reduction. Built in aluminium by New Zealand’s Diverse Projects to a design by LOMOcean Design, she was delivered in 2010 and features a sleek, minimalist interior design by Chris Connell, using neutral fabrics and soft furnishings. Accommodation is for 10 guests in four cabins including a full beam master suite and two twin VIP suites convertible to doubles. There is also a forward cabin equipped with four berths, making her perfect for families with children. All cabins come complete with flat screen televisions, satellite phones, Wi-Fi internet access and full en suite bathroom facilities. Big, bold windows in the main saloon set the tone for the interior living spaces, with the emphasis on natural light pervading the entire yacht and the lines of the interior are crisp and clean without being cold. The saloon stretches full beam, with a spacious aft deck seating area behind it, while a well-appointed galley is positioned ahead. Forward of the galley lies the bridge with custom windows designed by Glasshape to be able to withstand a 12 metre wave. On the upper deck of this yacht for sale there is ample space for a tender and two jet skis as well as a crane, while forward of that deck, an enclosed flybridge with a wealth of seating and a barbecue has proved a popular place for guests to enjoy a casual meal while underway. With crossings of the Pacific and Atlantic under her belt, Black Pearl has cruised nearly 30,000 nautical miles, demonstrating excellent seaworthiness. Twin 600hp Caterpillar engines give her a range of 3,000 nautical miles and she is fitted with Trac zero speed stabilisers. 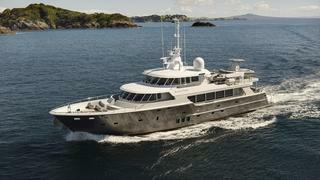 Lying in New Zealand, yacht for sale Black Pearl is now asking $11,750,000.